You are currently browsing articles tagged Charles de Gaulle. Here are photo instructions for RER B train from Paris CDG Airport Terminal 1 to central Paris (Roissy-Charles de Gaulle Airport to Paris). Click on photos to see larger versions. For train schedules, train ticket prices, maps and other details see the Overview CDG to Paris by Train article. For Terminal 2 instructions see CDG Terminal 2 to Paris Train. Due to the Paris train strike, RER B trains are running at reduced frequency between CDG Airport and Gare du Nord in Paris. More information on Paris train strike for Paris RER trains. * Warning! Thieves work on this train! If you’re arriving at CDG Terminal 1, you’ll first need to take the CDGVAL shuttle train to Terminal 3/Roissypole (center of map) to catch the RER B train to Paris. Terminal 3/Roissypole is the second stop which is before Terminal 2. The shuttle will stop at parking garage Pr before arriving at Terminal 3/Roissypole. 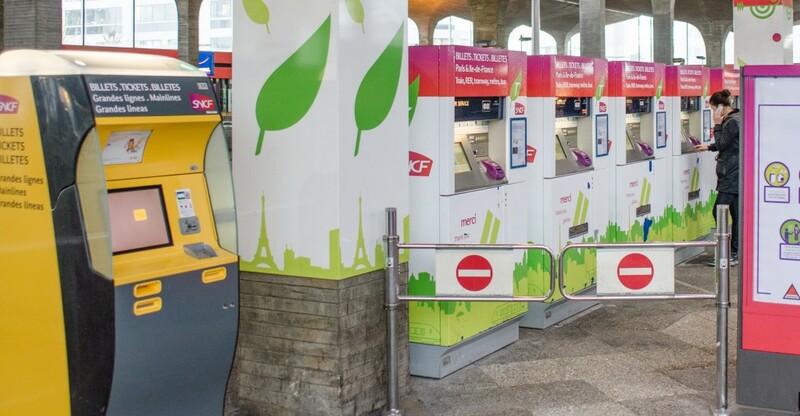 From here you can purchase single train tickets for Paris from the white/fuchsia vending machines (Billetterie Ile-de-France) for one way (price ). These tickets are known as “Billets Ile-de-France“. Keep in mind that these vending machines do not sell pass cards Pass Navigo and only take coins or smart-chip enabled credit cards. If your credit card is from the U.S., most likely it will not have a smart-chip and will not work with these machines. 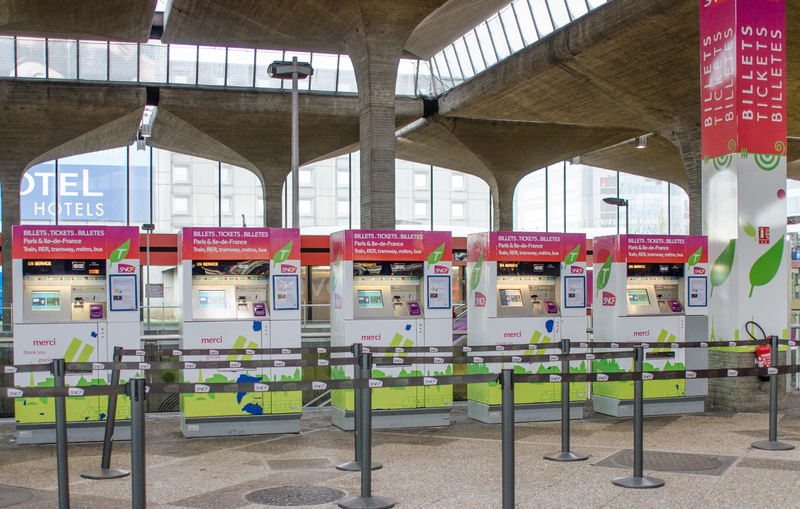 To purchase a Pass Navigo Decouverte (public transportation passes) you must visit the ticket window immediately in front of these machines (visible in photo below). If you already have a Pass Navigo / Pass Navigo Decouverte, you can recharge your card with Navigo Semaine from the white/fuchsia ticket vending Billetterie machines by inserting your pass into the purple Navigo slot and following the prompts. Beware of the purchase restriction schedule on the Pass Navigo. 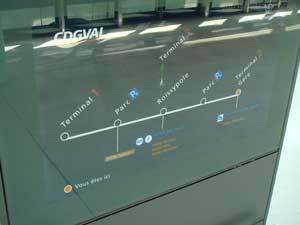 The video screens show the RER B train schedule arriving and departing CDG. The display screen on the right shows RER B trains towards Paris (bottom left edge of display reads: “Paris – St-Remy le Chevreuse – Robinson”). The screen on the left shows RER B arrival times from Paris to CDG Terminal 2 station (bottom left edge of display reads: “Aéroport Charles-de-Gaulle 2 TGV”). 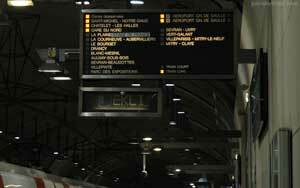 RER B trains leaving CDG going to Paris (right side screen) stop at all central Paris stations (Gare du Nord to Cité Universitaire, full list below) regardless of the name under the Destination column. The Destination names are the terminus stations for the several RER B train line branches and are used to specify the direction each train is traveling. A complete list of departure times from Terminal 1 RER B station towards Paris is available at the bottom of this article. Using a gate with a green arrow lit on its front (red X’s signify exit gates) insert your paper ticket into the yellow ticket reader (should be on your right, i.e. that gate’s green arrow should be pointing at you and you should be using your right hand to submit the ticket) then retrieve it from the top arm panel on your right. 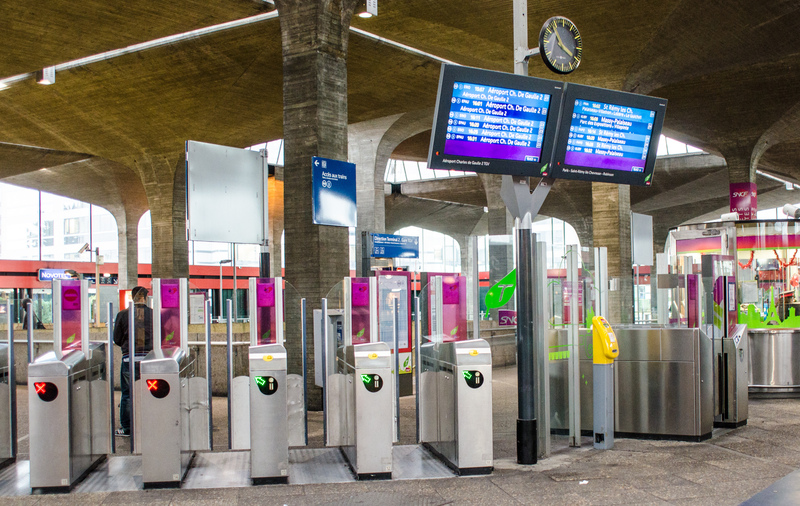 If using a multi-use train pass (Navigo or Navigo Découverte) place your Navigo pass against the purple pass reader on the top arm panel on your right of the gate. You’ll hear a pleasant “ding” if the pass is correctly read and contains the correct weekly fare. (You’ll hear an unpleasant “buzz” otherwise.) Descend onto the RER B train platform using the escalators or stairs. Signs at escalators and stairs descending onto the train platforms will note that “All trains go to Paris” (“Tous les trains vont à Paris”). Once the train arrives, the train doors may not open automatically. Press the small metallic or red rubberized button on the door to open the train doors. Remember to keep your ticket or passes handy as “controllers” (“ticket checkers”) frequent these trains. Travel time to the first major Paris station: Gare du Nord, is roughly 25 minutes. 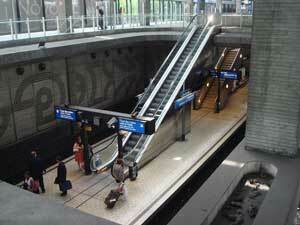 you haven’t exited the Metro/RER system (by passing through turnstiles or exit gates). your final destination is within Metro/RER Paris Zone 1-2. If you need to transfer to a bus or tram, you will need to purchase a new Paris Metro Ticket (known officially as Ticket t+) as transfers from Metro/RER to buses/trams are not included. The following train timetables show depature times of RER B trains leaving CDG Terminal 1 towards Paris. (Ignore the second pages, which show Terminal 1 to Terminal 2 departure times). First & last trains timetable for Paris Metro and RER A / RER B trains. Facts & Figures on RER B train line (video). 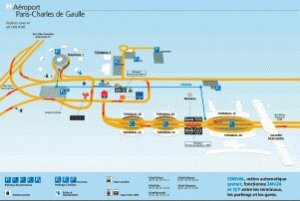 This is an overview of how to travel from Charles de Gaulle-CDG Airport to Central Paris by city train (RER B). For instructions in the opposite direction see Paris to Airport CDG by Train. For step-by-step photo instructions see Terminal 2 to Paris by train or Terminal 1 to Paris by train. Safety/Security: Thieves work on this train! 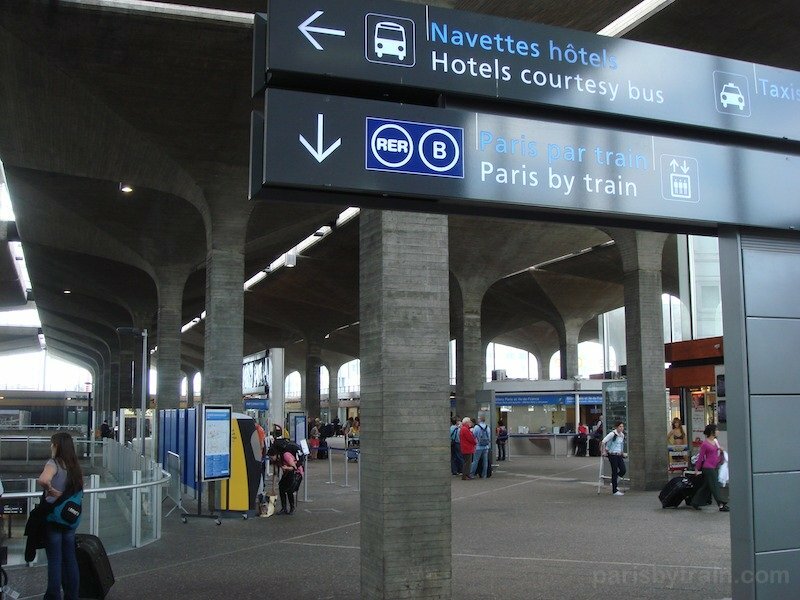 The quickest & least expensive way from Roissy-Charles de Gaulle (CDG) Airport to Paris is by taking the RER B city train leaving from either CDG Terminal 2 or Roissypole (RER trains for CDG Terminal 1 and CDG Terminal 3). 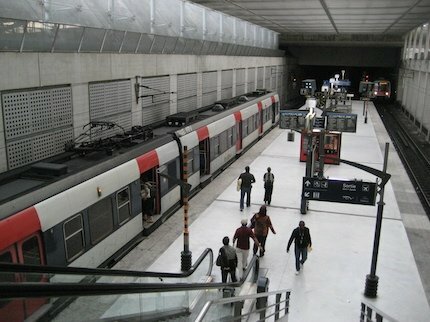 The RER B train line runs north-south through the centre of Paris, stopping at Gare du Nord, the London to Paris Eurostar station, then at Châtelet Les Halles the “super” exchange station with 4 metro lines and 3 RER lines available, then Saint Michel/Nôtre Dame, Luxembourg, Port Royal, Denfert-Rochereau, Cité Universitaire, and continues south towards Orly Airport (requiring a transfer onto the OrlyVal metro at station Antony). The two train stations at Charles de Gaulle Airport are named “Aéroport Charles de Gaulle 1” and “Aéroport Charles de Gaulle 2 – TGV“, the first being located near Terminal 3 in the Roissypole building and the second located between Terminal 2E and 2C. 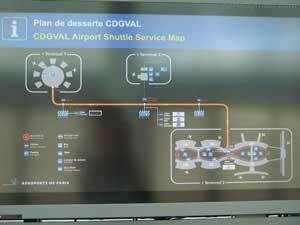 (A map of CDG airport is provided below). The first train leaving Charles de Gaulle Airport towards Paris departs at 4:56am from Terminal 2, stops at “Aéroport Charles de Gaulle 1” station two minutes later, and then reaches Gare du Nord in Paris at 5:26am. The last RER B train leaving airport CDG for Paris departs at 11:56pm just before midnight (update: see warning below), arriving at Paris Gare du Nord at 12:26am. This train schedule from CDG to Paris is the same every day of the week, including holidays. (For a complete timetable, see the schedule of RER B trains). For normal first and last train times see this timetable of first/last Paris Metro and RER A and RER B trains. 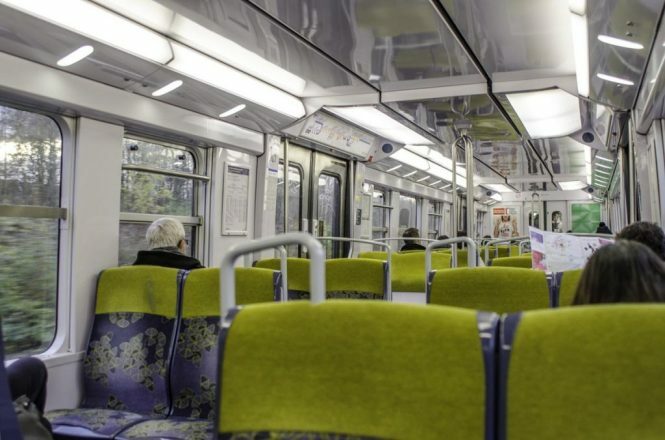 Buses will replace service along the affected part of the RER B line between CDG Airport and Aulnay-sous-Bois station. 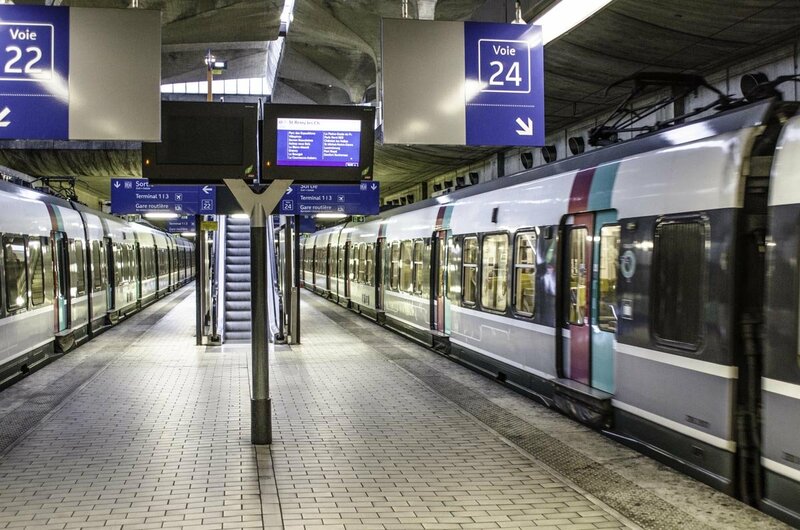 The RER B will operate normally between Aulnay-sous-Bois and Paris city-center, except on April 2nd when the RER B will be closed from Stade de France to the end of both northern end points (Mitry/Claye & CDG Terminal 2). Buses will replace service between CDG Airport & Stade de France. See construction bulletin (in French) for more information. For step-by-step photo based instructions see either CDG Terminal 1 to Paris Photo Guide or CDG Terminal 2 to Paris Photo Guide. If you’re landing at Terminal 1 you’ll have to take a shuttle train called CDGVAL to Terminal 3/Roissypole in order to catch the RER train. 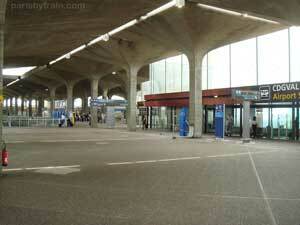 The name of this station is “Aéroport Charles de Gaulle 1“. Don’t mistake the “1” in the train station name as meaning “Terminal 1”, it doesn’t, it’s simply the first of the two train stations at CDG Airport. 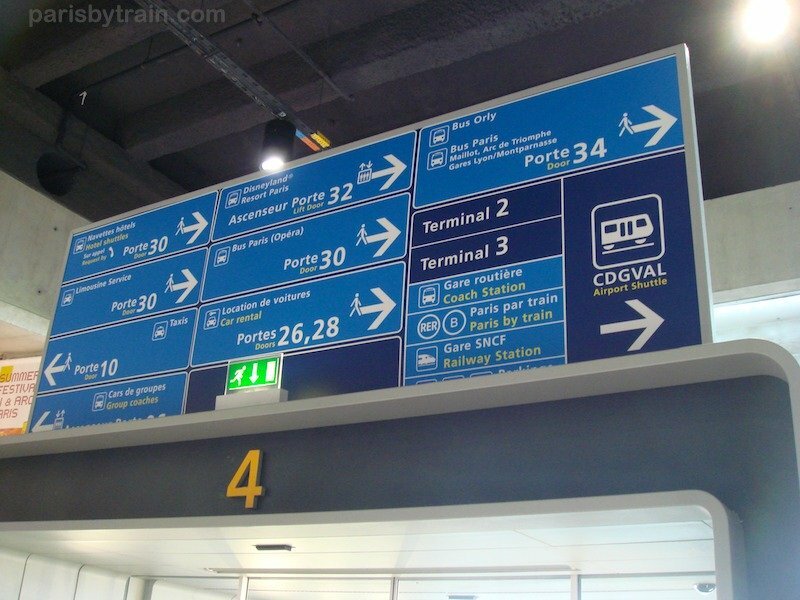 Just follow the signs for the CDGVAL tram within Terminal 1 and transfer to Terminal 3 / Roissypole to catch the RER B train to Paris. 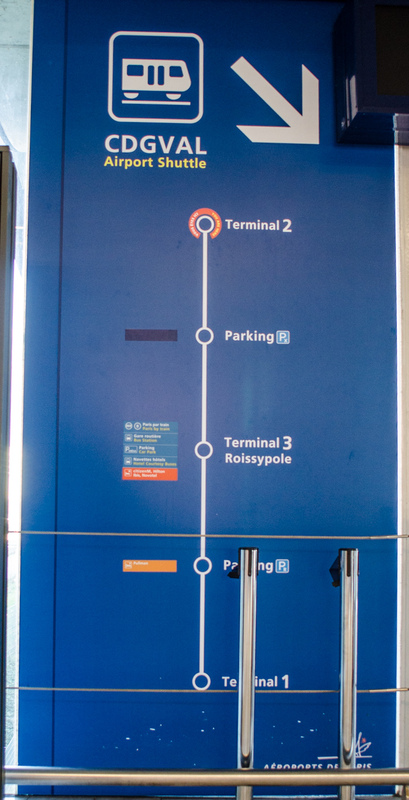 To make things more confusing, CDG Terminal 3 / Roissypole is located between Terminals 1 and 2, so traveling from west to east across terminals you’ll depart Terminal 1, arrive at T3/Roissypole, then CDG Terminal 2 at the opposite end of the airport. 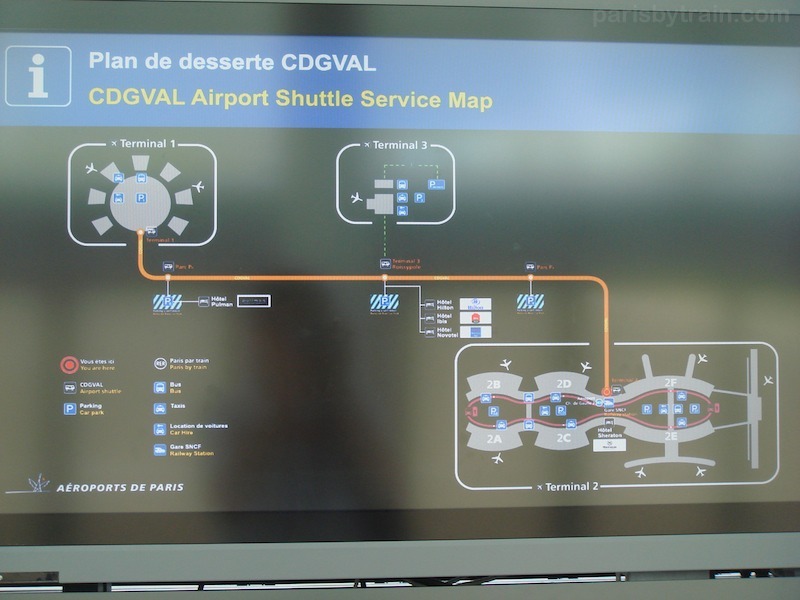 Keep in mind that the CDGVAL tram stops at parking stations in between Terminals 1 and 3 (Parc P-r), and Terminals 3 and 2 (Park P-x), so don’t get off CDGVAL too early. There will be voice announcements at each stop in French and English to help guide you. If you’re landing at Terminal 2, keep in mind that there are 7 sub-terminals and you must make your way to the train station which is located between sub-terminals 2E and 2F. There will be numerous signs through the terminals pointing towards the Paris RER train. Even more important to note is that any credit cards or debit cards without smart chips nor 4-6 digit PIN numbers will not work with these machines. 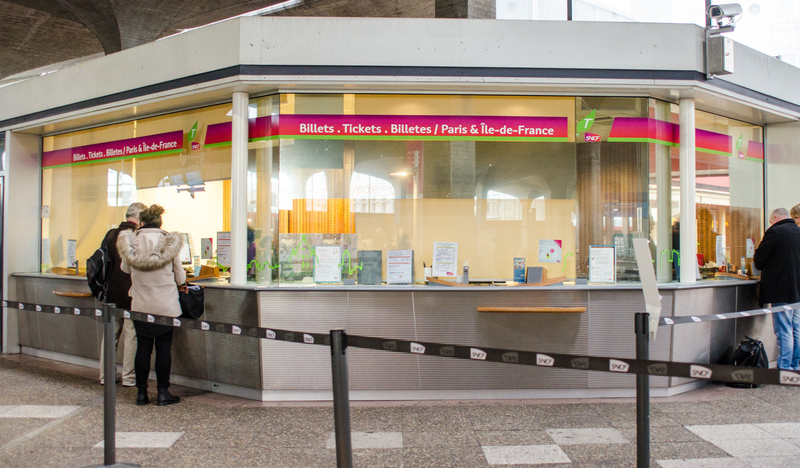 At the CDG 1 train station there is a large ticket window with 3 SNCF employees that will be selling train tickets for the RER Train (and will accept non-chip/PIN credit cards). At Terminal 2 there are two large train ticket offices on the bottom floor, one side selling Paris RER tickets and the opposite side sells SNCF/TGV tickets. If you’re facing this glass room, the entry on the left will be for RER tickets to Paris. The entry on the right is only for tickets to other cities. Almost always there will be at least one ticket seller that speaks English and it will be noted by a little British flag on the corner of his or her window. Either way, you’re looking to buy a ticket for “Paris Aller-Simple” [Pear-Ee Alleh-Som-pleh] which is a one way ticket. 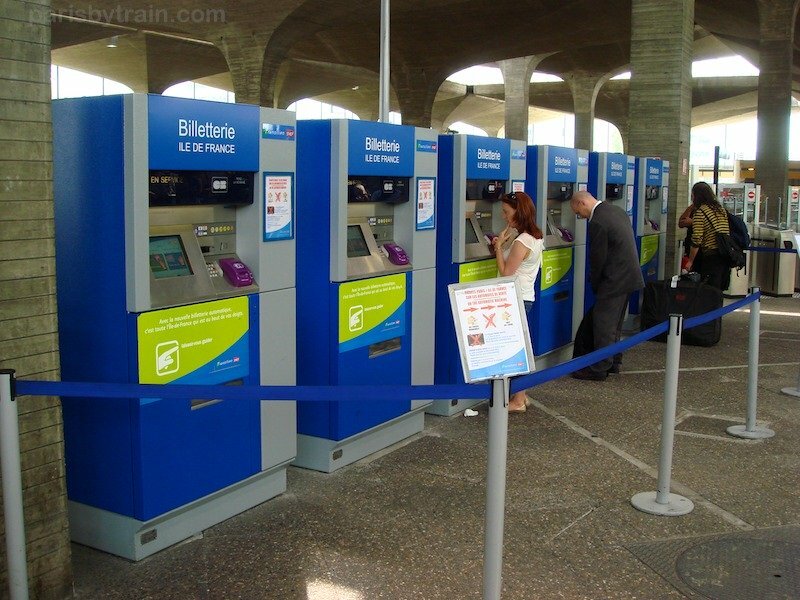 The price should be roughly for adult tickets and for children (9 and under) RER B train tickets to Paris (). For Aéroport CDG 1 train station the train platform is visible behind & below the train ticket vending machines. To access the RER B train platform, look for the entry gates with green lights on them (detailed guide). Terminal 2 CDG Train platform is also well marked: simply follow the signs that say “Trains to Paris”. It’ll be quite difficult to miss and all trains from these platforms travel to Paris. You can view the television screens while on the platform to see all the stops the train will make. The stops should include Gare du Nord, Châtelet les Halles, St. Michel-Nôtre Dame, Luxembourg, and others. The four mentioned here are the ones that the majority of travelers will be looking for as they’re all in central Paris. Gare du Nord is best for those going to a hotel near Sacré Coeur/Montmarte, Châtelet les Halles for those staying near the Louvre, St. Michel-Nôtre Dame is across the Seine (the Left Bank), and Luxembourg being near the Jardin du Luxembourg (Luxembourg Gardens). For those extra keen travelers, there are “express” RER B trains that leave from both train stations. Look at the television screens on the platform and note how many stops are between CDG train stations and the four central Paris stations mentioned above. The express RER B train will go directly from Aéroport CDG 1 to Gare du Nord, without stopping at any stations in between. The regular RER trains will make about 9 stops in between CDG Airport and Gare du Nord. You’ll save roughly 12 minutes by taking one of the express trains, but even the non-express RER B will get you to Paris (Gare du Nord) in about 34 minutes. This article explains how to travel from Central Paris to CDG Airport by city train (RER B). For instructions in the opposite direction see Airport CDG to Paris by Train. 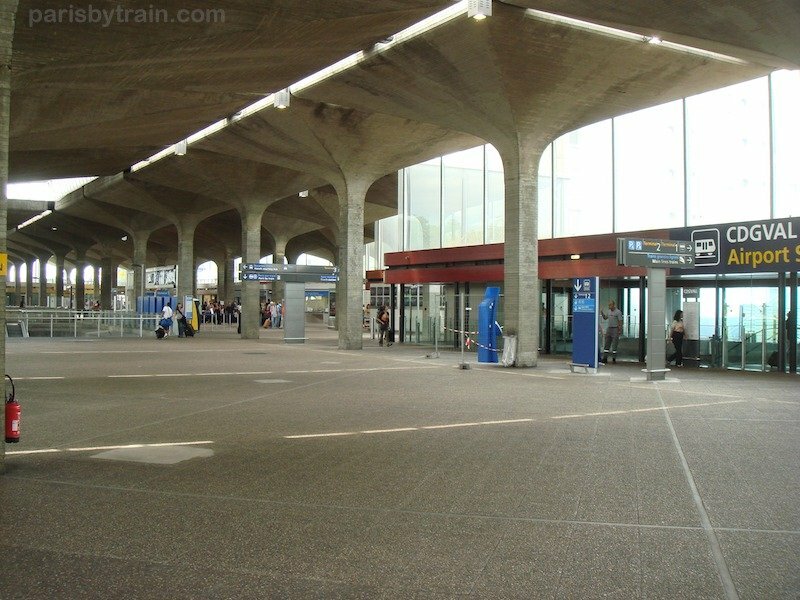 There are also picture guides of the Terminal 1 train station or Terminal 2 train station at Airport Charles de Gaulle. The cheapest and fastest transportation to Airport Roissy-Charles de Gaulle (CDG) from central Paris, is the suburban train line RER B (blue line on RER maps) at a cost of (), one way, requiring roughly 40 minutes. Within Paris the RER B line travels from south to north, stopping at Denfert-Rocherau, up past the Luxembourg Gardens (station name: Luxembourg), St. Michel/Nôtre Dame, Châtelet Les Halles, Gare du Nord, then continues north east, making up to 9 more stops on its way to CDG Terminal 1 and 2. The first train from Paris Gare du Nord to Airport Charles de Gaulle (CDG) leaves at 4:56am, arriving at Terminal 1 at 5:28am, Terminal 2 at 5:30am. The last train at night from Paris Gare du Nord to CDG leaves at 12:14am (past midnight) arriving at Terminal 1 at 12:47am, Terminal 2 at 12:49am. This train schedule is in effect Monday to Sunday, including holidays (every day). Note that not all RER B line trains stop at Charles de Gaulle airport. The easiest way to determine whether the next RER B train arriving at a station goes to CDG is to look at the RER overhead station stop panels on the train platform. If a light is lit next to “Aéroport Ch. de Gaulle 1” or “Aeroport Ch. 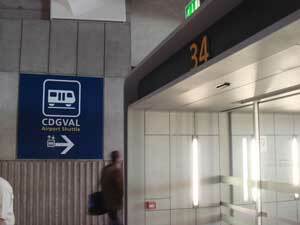 de Gaulle 2 – TGV”, the next train will stop at CDG airport. You’ll also be able to tell how many stops the next train will make between Paris and the Airport by counting the number of stations in between Gare du Nord (the last Parisian station) and the airport stations, Terminals 1 and 2. Obviously, the train making zero stops in between Gare du Nord and the airport will be a bit quicker, usually by about 12 minutes. Another way to tell if the next train is going to the airport is to look at its four letter “name” and whether it starts with the letter “E”, which is marked on overhead television monitors, as well as on the front of the train. 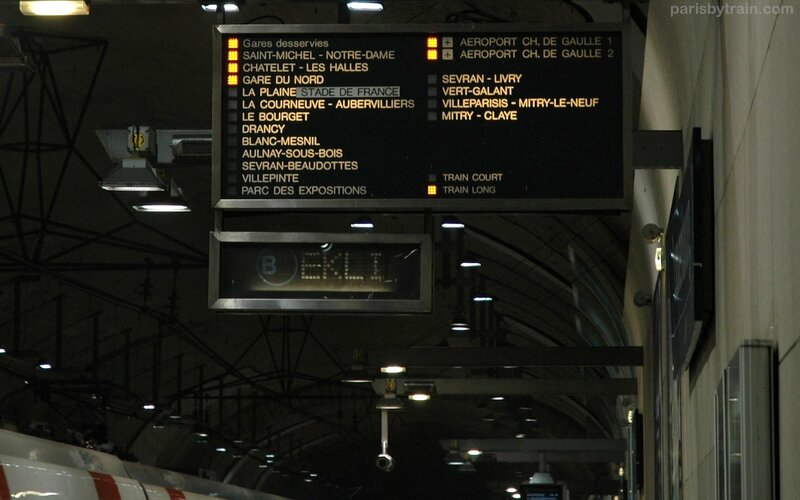 All trains with names that start with E will stop at Charles de Gaulle, for example: EKLI. If a bunch of other travelers are getting on with suitcases and look like the traveling type… more than likely you’re on the right train. 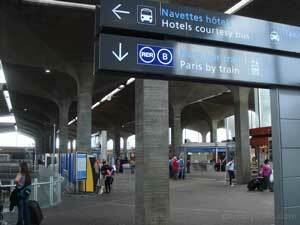 When arriving at CDG the train will make stops at both Terminal 1 and Terminal 2. 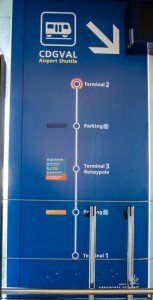 For those getting off the train at Terminal 1, you’re in fact arriving at Terminal 3 and you’ll have to take a shuttle tram called CDGVAL to Terminal 1. Remember to take note of which side of the CDGVAL tram line to get on, as Terminal 3 is actually in between Terminals 1 and 2, so you have to pick the correct direction to go. There should be floor standing signs on the overhead walkway above the tramline to help you make your choice. If you’re looking for the departures level, you’ll need to head to the escalators or elevators and make your way up a floor.